Please click on the thumbnails to view screenshots. 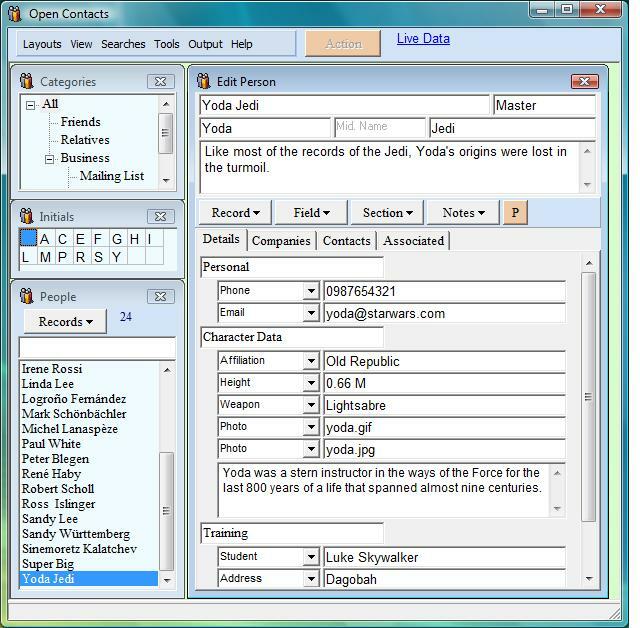 The way of editing contact info is similar to the way of hand-written address book which is more flexible than static electronic form. And you may have stronger focus on contact info available. Better than paper media, you may easily expand fields if more contact info is available. Display both people and companies at the same time. When there are many fields of sections and some sections are hidden below, a list of link tabs to sections will appear. Clicking on a link tab will bring up the section. Photo could be attached to a contact using fields associated with the "image" action. You can use either built-in viewer or default external program to view. This company has two subsidiaries. This company has 2 contact persons and one parent company. To lookup contacts with keyword, you may simply key in, and Open Contacts will start the search for you. The function is enabled through the Options window. Check the checkbox "Quick Search by Contact Name" in the View tab.